The Olympics begin in two weeks, and you will spend a fortnight obsessing over athletes and sports you won't think about again for another four years. (If then.) To prepare you for the big games o' London, we're showcasing a different athlete every weekday until they begin. Today: Michael Phelps. Previous Olympic experience: Sixteen medals, fourteen golds. Six golds, two bronze at the 2004 Sydney Olympics. Eight golds at 2008 Beijing Olympics. You might know him from: Uh, the 2008 Olympics, which he essentially dominated. Also, he hosted Saturday Night Live, poorly, though he does win points for having been in the "Space Olympics" sketch. Also: Bongs. Most embarrassing public moment: Probably the bong thing, though he was really, really bad on SNL. Most proud public moment: Take your pick from any of those fourteen gold medals. 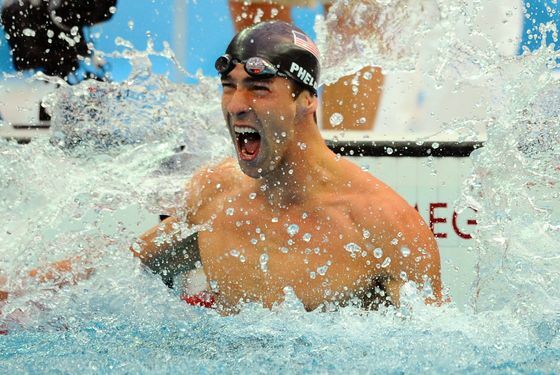 What to expect from him this year: For a guy who currently holds seven world records, Phelps is relatively quiet this year, overshadowed in some places because of his teammate Ryan Lochte, who's the one on the cover of Men's Journal. Plus, Phelps has teammates (inferior teammates, it's worth noting) calling his training habits "lazy." Still: He's Michael Phelps. He's won more medals than any other American ever. He'll add some more. Odds that you'll remember his name in four years: Do you remember it now? We bet he's the only non-basketball playing 2008 Olympian whose name you remember. So you have to like his odds to reside in your subconscious come 2016 as well.